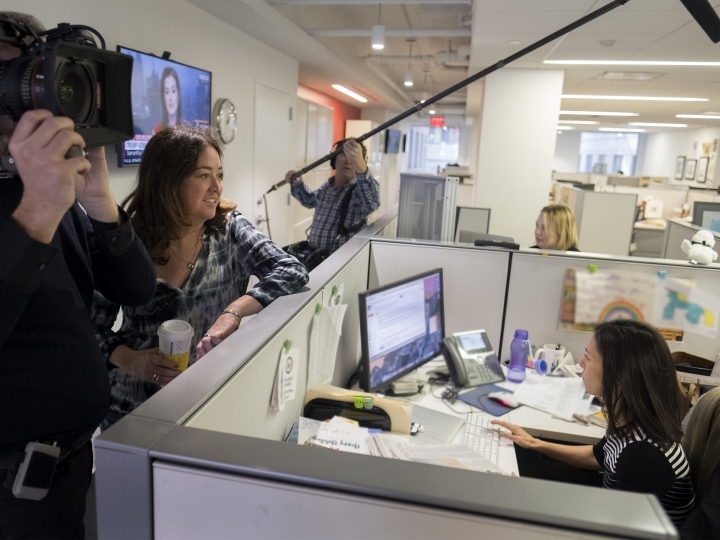 NEW YORK — Liz Garbus' first day shooting inside The New York Times newsroom was President Donald Trump's inauguration day. Her final day was April 16, when the Pulitzer Prizes announced the Times had won three of the coveted awards. In between, she spent more than a year documenting one of journalism's most distinguished institutions while it grappled with, and tirelessly reported on, an unprecedented presidency. From the first moments of "The Fourth Estate" — as Times Executive Editor Dean Baquet watches Trump sworn on a screen in the newsroom — there's the dramatic air of a gauntlet being thrown down. "What a story," marvels Baquet. The first episode of "The Fourth Estate" premiered Saturday as the closing night film at the Tribeca Film Festival. It will air on Showtime beginning May 27. A bracing, real-life thriller with shades of "All the President's Men" (Trent Reznor and Atticus Ross supply the propulsive soundtrack), the docu-series gives a rare view of the day-to-day toil of investigative journalists navigating an unpredictable and ceaseless story. And in giving such a window into the machinations of The New York Times, "The Fourth Estate" surely will give fodder to both supporters and critics of the newspaper. Trump has frequently attacked the press, but his gripes with "the failing New York Times ," as he has repeatedly called it, have been especially pronounced. He recently called White House correspondent Maggie Haberman, who shared in one of the Pulitzers, a "third-rate reporter" and claimed he doesn't speak to her. Haberman, a key figure in the documentary, is seen interviewing Trump by phone in "The Fourth Estate." "I honestly believe if people get a look inside the newsroom of the New York Times, it will only help us," Baquet said in an interview. "It humanizes the New York Times. It shows our flaws, too. How could it not?" said Baquet. "But it shows a bunch of reporters and their editors struggling to cover a big story. It shows the impact it has on our daily lives when we do that. I think it shows us as regular people as opposed to arrogant, distant, whatever the worst is people think of us. I think it's good for the Times, and I think it's good for journalism." Garbus, whose 2015 Nina Simone documentary "What Happened, Miss Simone?" was nominated for an Oscar, first conceived of the project while contemplating postelection subjects. When Trump, then president-elect, engaged with a back-and-forth with the Times over an interview at the newspaper's offices , a light bulb went off. "I thought: Wow. Wouldn't it be great to be a fly on the wall of this president-elect meeting with his hometown newspaper that he constantly disparaged yet clearly craves its positive coverage? What an interesting dynamic, what an interesting relationship," Garbus said. Garbus initially reached out to the newspaper through a friend, Times Magazine writer Jonathan Maler. He introduced her to Sam Dolnick, an assistant editor, who brought the idea to Baquet. An agreement was quickly reached so Garbus could begin shooting by January. Participation would be up to individual reporters. If the cameras picked up a confidential source or something off-the-record, Garbus immediately deleted the footage. Baquet grants the newsroom was "mixed" on having cameras in its midst and that some found it intrusive. But many of the reporters frequently documented include some of the newspaper's page-one regulars: Michael S. Schmidt , Matt Apuzzo , Adam Goldman , Mark Mazzetti and Haberman . Many scenes focus on landing scoops and the newsroom conversations over framing a day's news. One scene captures Washington Bureau Chief Elisabeth Bumiller in a tense disagreement with editors in New York over coverage of the president's State of the Union address. Other scenes focus on the personal toll of keeping up with a relentless news cycle. "I saw people struggling with questions of how to face a relentless assault on norms," Garbus said. "And I saw investigative journalists faced with a story of a lifetime and at the top of their game. I saw human beings who are competitive by nature engaged in a dogfight." The inner-workings of the Times have been documented before. In 2011's "Page One: Inside The New York Times," filmmaker Andrew Rossi focused on the newspaper's media desk at a time of digital transformation. Though the Times' own review, by freelance writer Michael Kinsey, slammed the film as "a mess," it helped establish the enduring cult of the late David Carr. His dressing down of Shane Smith, co-founder of media company Vice, remains a beloved defense of old-school journalism. Such transparency, Baquet said, "helps build our credibility." "If people see Maggie Haberman go about her business and how much reporting she does, I think if people see the Washington bureau struggling with covering the daily news, it builds our credibility," he said. "It lets people see how much work goes into it, the complexity. To be frank, it's a group of dedicated professions trying to do their jobs." The beginning of "The Fourth Estate" captures the veteran newsman thrilled by the challenge of covering a Trump presidency. "Great stories trump everything else, right?" Baquet says. After a year and half of covering the administration, does he feel the same way? "Do I think it trumps everything? Probably not," Baquet said, chuckling. "It trumps a lot but probably not everything."